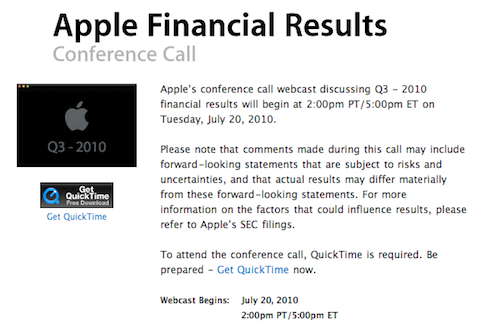 Apple has announced on their QuickTime website that their financial results conference call for Q3 2010 will take place at 2 PM Pacific time July 20th. Investors and others are encouraged to listen in on the conference call via a QuickTime stream. Although these conference calls usually include Q & A with Apple executives, ground breaking information is rarely unveiled. We’ll be sure to post a reminder prior to the event along with important updates during the stream.